King-Cat Subscriptions are available, see chart below for rates! KING-CAT COMICS #75 (April 2015): This is a book-length tribute to my longtime cat buddy, Maisie Kukoc, from the moment we met to the time of her passing, and beyond. 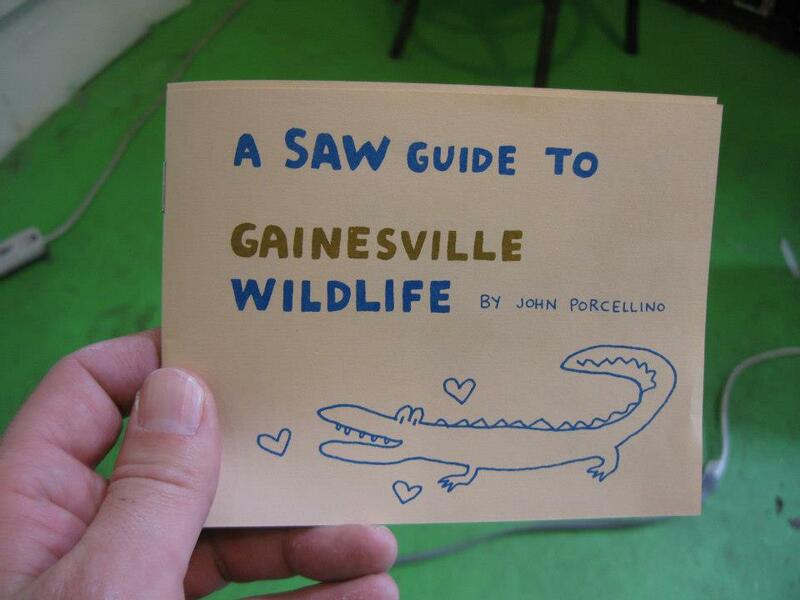 Nominated for a 2015 Ignatz Award for "Outstanding Minicomic." Cat lovers and lovers of life and love will find much to explore here. 48 digest pages, black and white, $5.00. 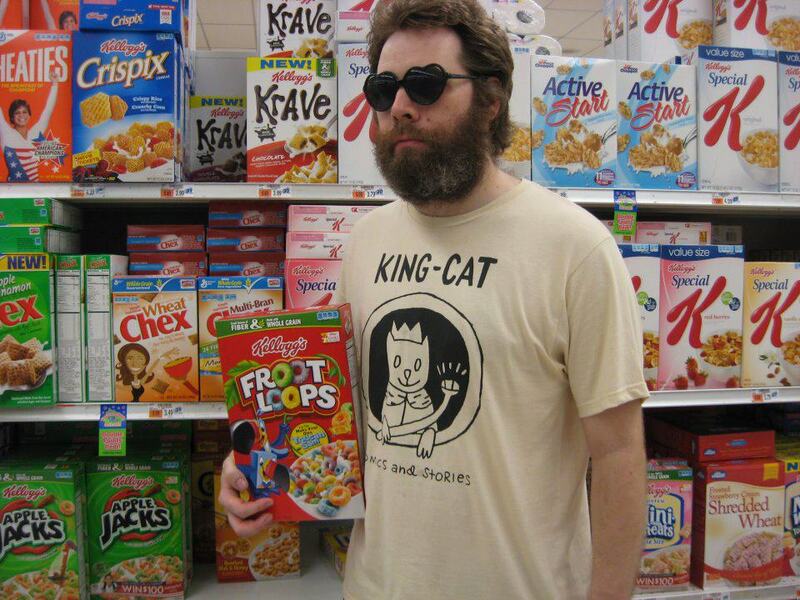 KING-CAT COMICS #73 (August 2012): Recent issue features that rascally Mr. Bowser, Cat Fun, In Search of the Cuckoo Bird, a Comix Dream (with cameos by Kevin H. and Anders N.), letters, a poem, Top 40, and more! 32 digest pages, black + white; $3.00. 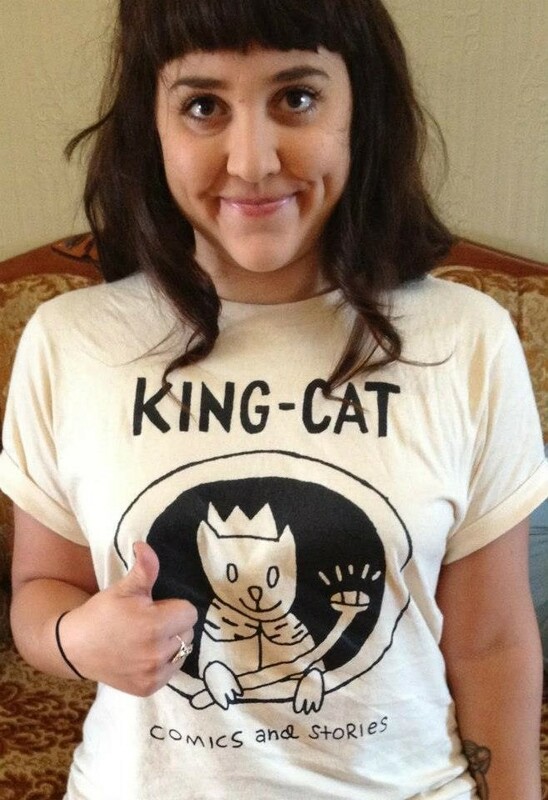 KING-CAT #72: Features heartbreak, lonely skies, woodchucks, bats, cats, dreams, and radioactive squirrels; Top 40, more. 32 digest pages, black and white. $3.00. KING-CAT #71: This one features: Lost Denver, Street Encounter, Tenderness, Middle-Aged Dirtbag, The End of a Love Affair, and much more. 32 digest pages, black and white. $3.00. KING-CAT #70: Marking the King-Cat 20th Anniversary, this issue features: Depression, Meds, Alcohol; Them There Skweezils; Frustration, Diogenes of Sinope and Square-Head John (Return to Trinidad); Plus Top 40, and LOTS MORE. Not as sad as one might think. 36 digest pages, black and white. $3.00. KING-CAT #69: This cat-centric issue features a nice mix of funny and sad stories: The Skweezil Cat Chronicles, Moon, Clouds, Heavy Metal Memories, and a poem: Ghetto Palms; Plus: Top 40, letters, and lots more! 32 digest pages, black and white. $3.00. KING-CAT #67: A loose collections of stories and shorter impressions... art, fear, and opening up. Sleeping in the Car in L.A., Colorado Folk Artist Square-Head John, Walking in San Francisco; plus letters, Top 40 and much much more. 40 digest pages, black and white. SOLD OUT! KING-CAT #66: This issue includes two "long" stories: "Las Hojas" -- about playing football with the kids in my old neighborhood, and "Freeman Kame" about... Freeman Kame. Plus Snornose, Blue Light, and a letter from Al. 36 digest pages, black and white. $3.00. SILLY-CAT #1: I found a box of these I didn't know I had, so this 1997 flip-book done with Joe Chiappetta is back in stock! 32 oversize pages feature otherwise unavailable King-Cat and Silly Daddy comics, plus color covers and a color jam centerfold. Wowza. $2.00. ►NEW! 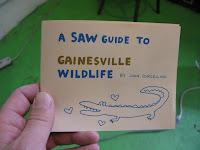 -- A SAW GUIDE TO GAINESVILLE WILDLIFE by John Porcellino (2013): While I was down in Gainesville in February we put together this little zine of 10 inkwash drawings of Florida Wildlife, including gators, bugs, lizards and snakes. A portion of all proceeds goes to the Sequential Artists Workshop. 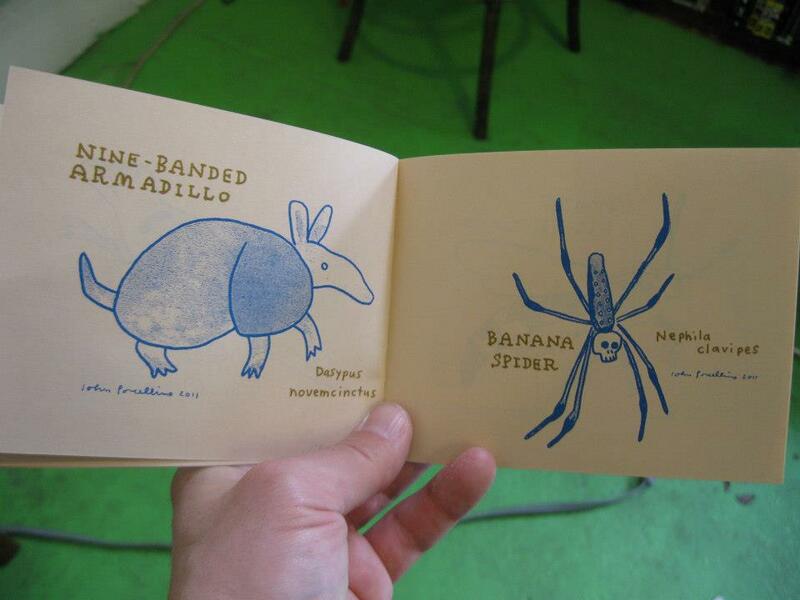 16 mini-pages, 2 color risograph printing; $3.00. 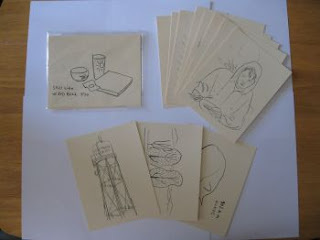 ON RUBY HILL by John Porcellino (2009): This zine collects poetry written by yours truly from 1997-2002, and acts as a kind of supplement to Map of My Heart. Includes 30 short poems (text only, no illustrations). 16 digest pages, $2.00. 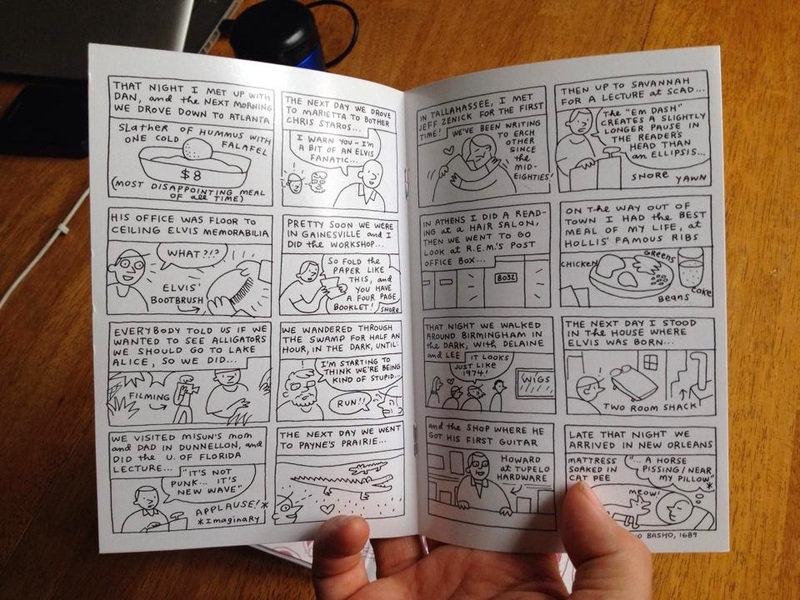 THE ONES THAT EVERBODY KNOWS by John Porcellino (2006): This minicomic features a brief poem/comic (four pages) about stars. 8 mini-sized pages total, $1.00. 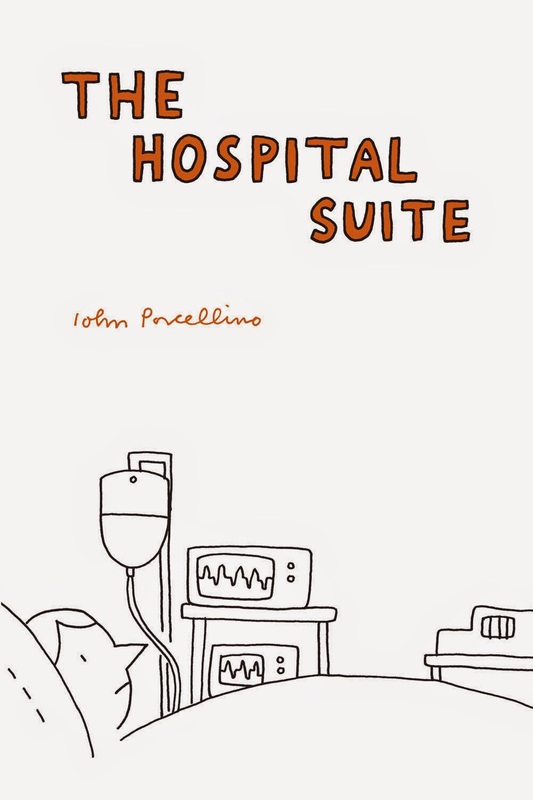 THE HOSPITAL SUITE (Drawn & Quarterly, 2014): My new book collects three all-new stories dealing with my history of physical and mental problems. "The Hospital Suite" recounts the summer of 1997, when I was repeatedly hospitalized with a mysterious abdominal ailment; "1998" covers the fallout from my surgery in '97; and "True Anxiety" details my struggles with anxiety and obsessive-compulsive disorder, from childhood through the present day. Surprisingly, not as depressing as you might think, with plenty of big laffs. 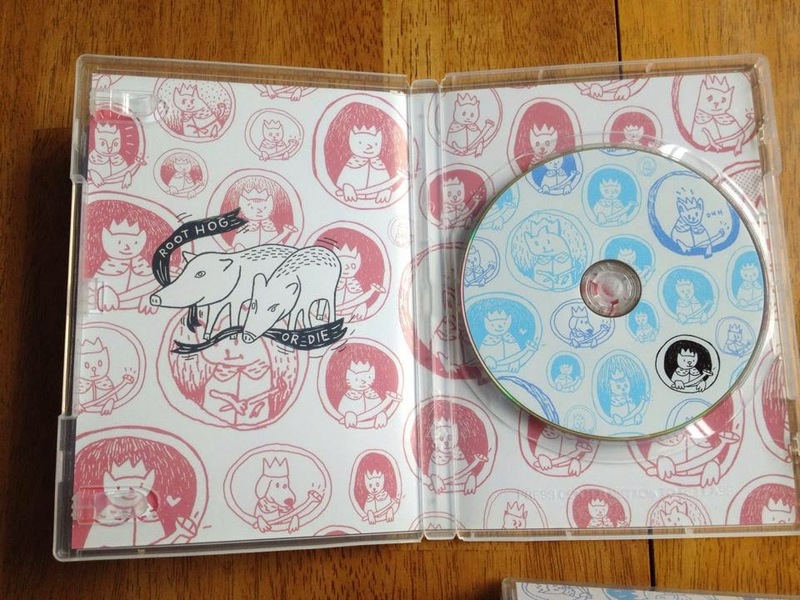 Includes bonus comics and notes in the back. 264 pages, approx 6" x 9", two-color covers, b+w interiors, softcover; $23.00. THE NEXT DAY (Pop Sandbox, 2011) by Paul Peterson and Jason Gilmore, Illustrated by John Porcellino. This collaborative project features the true stories of four suicide survivors-- the lives that led them to their decision, and their lives in the wake of it. Published in conjunction with a National Film Board of Canada sponsored web-documentary. 100 pages, in navy blue ink; softcover, perfect-bound; $17.00. MAP OF MY HEART (Drawn and Quarterly, 2009) by John Porcellino: Map of My Heart collects selections from King-Cats 51-54, as well as issues 55-61 in their (near) entirety, including such classic KCat strips as "I Saw Where the Root Hog Lives," "Psalm," "Forgiveness," "Introduction to the Night Sky, " and "Punt No Tell," among many, many others. Over seventy-five individual comics and stories are included, PLUS: Extensive endnotes, maps, bonus comics, journal entries, and the complete 24-page mini-zine, The Kukoc Cat Named Maisie. 360 pages, softcover, $25.00. THOREAU AT WALDEN (Hyperion, 2008) by John Porcellino, from the writings of Henry David Thoreau: On Independence Day in 1845, the American philosopher Henry David Thoreau moved into a small cabin, built by his own hands, on the shore of Walden Pond outside Concord, Massachusetts. He lived there for two years, two months, and two days, and wrote a book about his experience called Walden, which has gone on to become one of the most influential philosophical works the world has known. Walden's message of self-reliance, self-reflection, social criticism, and harmony with nature has resonated with readers for over 150 years. Thoreau at Walden is an impression of Thoreau's time at the pond, with text taken directly from Thoreau's own published writings. Henry David Thoreau is one of my biggest inspirations as an artist and as a human being, so this project was very near and dear to my heart. 110 pages, 8" x 10.5", with and introduction by D.B. Johnson, coloring by JP Coovert; with endnotes and a quotational cross-reference. 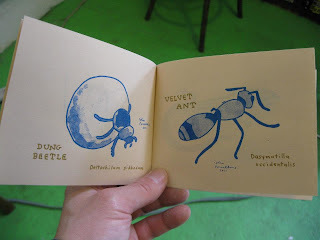 Color covers, interiors in brown and black ink; Hardcover. $17.00. ONLY A FEW LEFT! KING-CAT CLASSIX (Drawn and Quarterly, 2007) by John Porcellino: This 384 page hardcover collection compiles the "best-of" the first fifty issues of King-Cat, 1989-1996. It features such classic strips as "Hold Everything" and "Ringtail Revenge" (starring Racky Raccoon), "Three Balls," "Ed the Happy Trucker," "October," "Justify My Love," "Desperation Angels," and much, much more, including the All Sam issue and the Violent Garden, Ranks of the Damned, and Cadillac March series in their entireties! Rounding things out are a generous selection of King-Cat articles, essays, "Snornose Pages," Top 40's, letter columns, cover images, and an extensive set of endnotes. Beautifully designed by Tom Devlin, this book is a giant chunk of King-Cat history, much of it unseen for over fifteen years! PERFECT EXAMPLE (Drawn and Quarterly, 2005) by John Porcellino: This collection contains all the King-Cat stories taking place in the year 1986: "Live Evil" (from King-Cat #50), "Belmont Harbor" (From King-Cat #47), "Perfect Example" (52-53), and "Escape to Wisconsin" (from issue #50). An epic story of teenage confusion: Girls, friends, girlfriends, guitars and punk rock. Full color covers, nice colored ink interiors, squarebound paperback with French flaps. 124 pages. $17.00. KING-CAT POSTCARD SET: Images from my sketchbook, circa 1998. Set of sixteen different images on cream colored cardstock. Comes in a little plastic pouch. 5.5" x 4.25", $3.00. DON'T FORGET TO SPECIFY WHICH SIZE YOU'D LIKE! 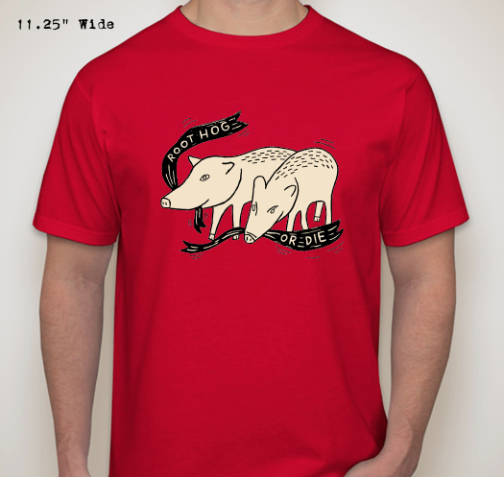 And after you buy your T-Shirt, send me a pic to post on my Facebook Page! 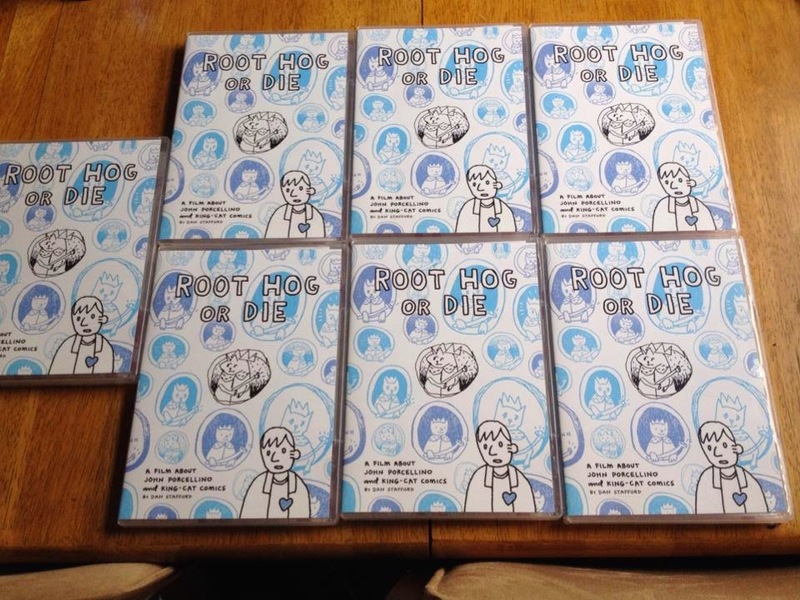 The ROOT HOG OR DIE DVD includes the entire full-length 100 minute documentary, plus outtakes, bloopers (! ), and an all-new exclusive 8 page comic book!